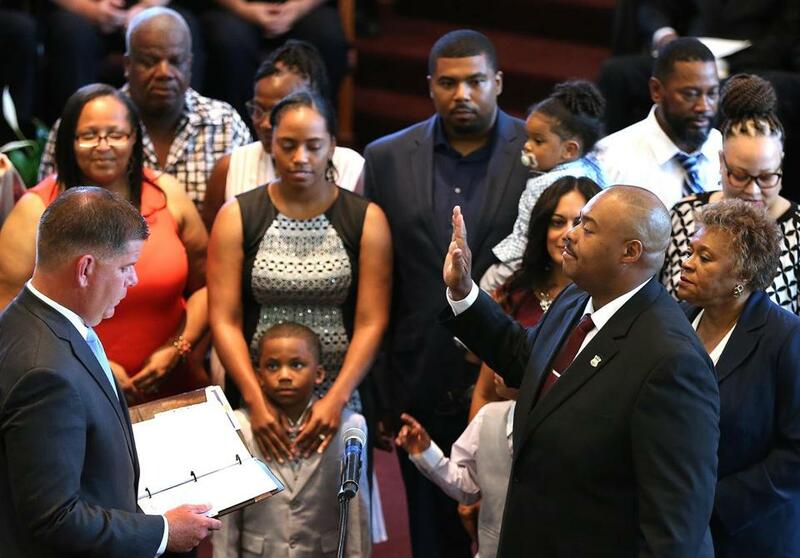 Mayor Martin J. Walsh swore in William G. Gross as the 42nd commissioner of the Boston Police Department Monday at the Morning Star Baptist Church in Mattapan. 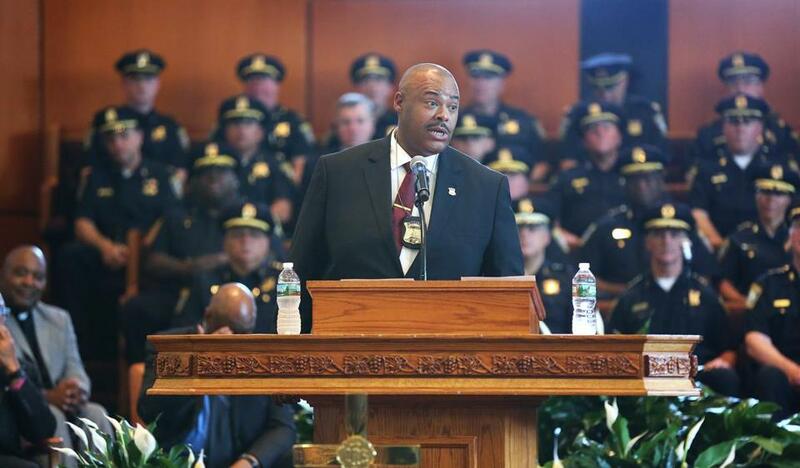 Before the “village” he said helped guide him, William G. Gross was sworn in as Boston’s 42nd police commissioner Monday in a historic ceremony during which the city’s first black police leader vowed to move the department into new frontiers. 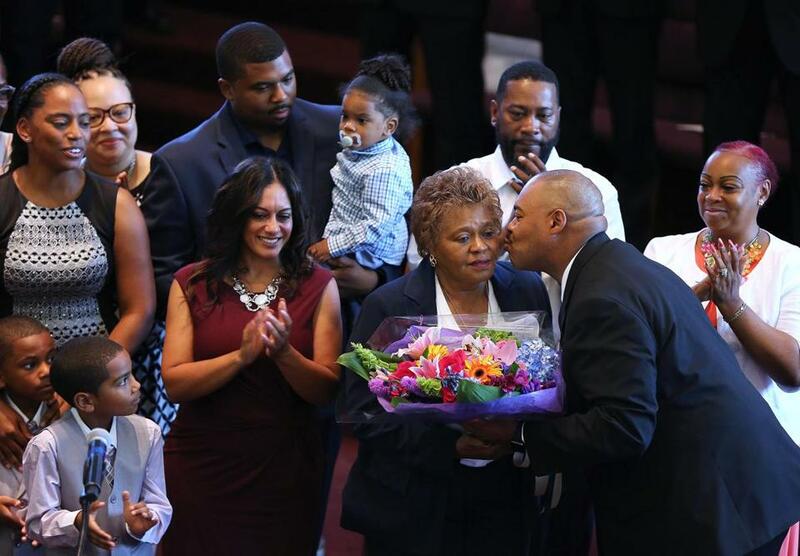 Gross, 54, appeared at once emotional and confident as he took the oath before his police colleagues, clergy, and community leaders at the Morning Star Baptist Church in Mattapan, where his mother has been a member for decades. He placed his badge on a necklace upon his mother and gave her flowers. He said her work in the community and the community’s support for her, a single mother, helped navigate him from the city’s streets to the police force and through the ranks to his appointment as commissioner. “The people of the community throughout my years . . . were right there every step of the way,” said Gross, a 33-year veteran of the force. In his 20-minute speech, he said his focus will be to sustain the community policing work that has made the department a national model, at a time when relationships between police and communities are more hostile in other cities. Gross is expected to lay out more of his community policing strategy, including his command staff, later this week, a department spokesman said. In his remarks, Gross said his administration will be marked by four key initiatives: sustain the department’s community policing work; improve transparency within the department; set out a plan to diversify the department across the city; and promote wellness programs for police officers, saying officers “are not robots” who are immune to the trauma they encounter on the beat. Gross addressed the crowd, which included police officers, after he was sworn-in. Serving as the backdrop to Gross’s ascension is a city that still bears the scars of a racist past. The swearing in was held in one of Boston’s most popular black churches, in a predominantly black neighborhood. Bishop John M. Borders III, in giving an invocation, recalled to the crowd that in the 1990s, a gang member tried to kill someone during a funeral. And today, he noted, the community was celebrating the appointment of a black commissioner. Gross replaces William Evans, who retired last week after 38 years with the force, including five as commissioner. Friends and community members who have followed Gross since he was a teenager growing up in Dorchester recalled he had been destined for the position, citing his good deeds as a youngster. Mayor Martin J. Walsh said that Gross represents the everyday people of Boston he is looking to serve. “It is in his identity,” Walsh said, adding he will work to help the drug addicted, and the homeless, immigrants, and youth entangled in senseless violence. Overall, both crime and arrests have decreased in Boston in recent years, though the total number of fatal shootings has crept up yearly since a 15-year-low in 2015. The mayor said Gross will show that “strength is rooted in love, not fear,” at a time that Washington, D.C., politics have divided the country. 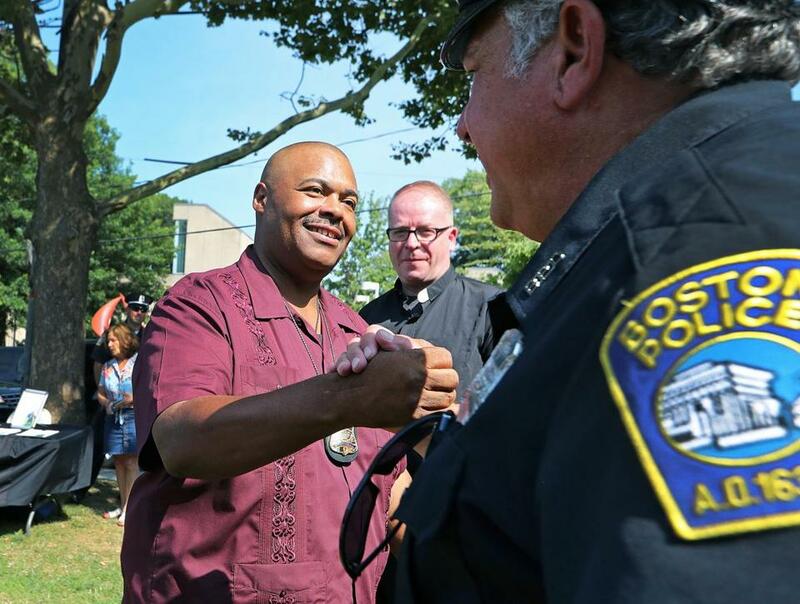 Two hours later, the mayor and Gross toured together several city neighborhoods, from Brighton to Roxbury, as part of the 35th annual National Night Out celebration of community crime watch groups. There, the mayor reiterated his vision for Gross and the 2,200-member department. At the first stop on the tour, at Brighton Commons, locals expressed excitement at meeting Gross and asked him for a photo. The owner of a Greek restaurant invited Gross over. “Oh, I’m gonna come see you,” the commissioner responded. “Congratulations, welcome to Brighton,” said Debi Franks, a retiree and neighborhood resident. Later in the day, Gross visited National Night Out events held across the city. Above, Gross was greeted at a stop in Brighton by Officer Jerry Ajemian. Milton J. Valencia can be reached at milton.valencia@globe.com. Follow him on Twitter @miltonvalencia.